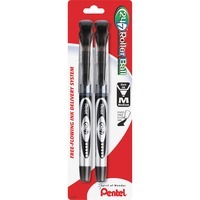 Pentel 247 Rollerball Pens PENBLD97BP2A $2.89 247 Rollerball Pen features a free flowing ink delivery system so your writing will glide effortlessly across paper. Make a bold statement with the concentrated, brilliant colored ink. Durable metal tip delivers the dark, vivid liquid ink. Barrel color indicates ink color. Nonrefillable rollerball pen is ideal for home, office and school.